In the wide framework of cultural resources present on a territory, there are still instruments and assets that, for multiple reasons, do not enter in traditional mixed offer of a city or a region. Ecclesiastical cultural heritage is often part of the structures that public administrators let slip. For Italy, it seems like paradoxically. While an important part of the art history and of cultural heritage is related to the history of Church, and while there are almost no cultural itineraries that do not include an ecclesiastical reference, the so-called “ecclesiastical museums” are still a marginal part of the policies realized to improve cultural, social and economic growth of our territories. In this article, we will discuss both the theoretical implication and the concrete opportunities that the empowerment of the ecclesiastical museums could generate for Italian territories, in terms of touristic, cultural and spiritual offer. As occur for “secular” ones, the ecclesiastical museum expresses a set of differentiated values that we need to take into account: the economic and social values are, therefore, specific consequences of the intrinsic cultural and historical values represented by the artworks that the museums store and protect. Furthermore, ecclesiastical museums present an aspect that every kind of consideration needs to take into account: the relevance of the spiritual and religious values and the role of the artworks as an important tessera in the wider mosaic of the evangelization function. The article will therefore discuss three main aspects of the Italian ecclesiastical museums: first chapter, “From religious to spiritual” will briefly deal with the theoretical dimension of the role and the relevance of ecclesiastical collections and their inclusion in a broader cultural dimension. The second chapter “Ecclesiastical Museums and services” will analyze services and main characteristics shown by ecclesiastical museums in Italy. Third section will finally introduce the potentiality of the introduction of ecclesiastical museums in different networks, considering the recent growth of cultural and spiritual products or services. In this article we will not aim at discussing the relationship between religion and spirituality; this topic should deserve a wider reflection and a more appropriate contextualization. Nevertheless, considering the spiritual role that Church plays in contemporary world is functional to the recognizing of the cultural and social values hold by ecclesiastical museums. Despite these reflections are strongly related with an ecological concern, they could have direct implications in the Church cultural approach too. Organized programs designed to increase productivity should have but one aim: to serve human nature. They should reduce inequities, eliminate discrimination, free men from the bonds of servitude, and thus give them the capacity, in the sphere of temporal realities, to improve their lot, to further their moral growth and to develop their spiritual endowments. When we speak of development, we should mean social progress as well as economic growth. It is not enough to increase the general fund of wealth and then distribute it more fairly. […]. Man is truly human only if he is the master of his own actions and the judge of their worth, only if he is the architect of his own progress . Indeed, this approach, whose relevance today is strong as ever, could represent a starting point to re-thinking the Ecclesiastical Museum as an important resource to reflect on the relationship between religions (not only Catholic Church) and the contemporary world and its growing atheism and agnosticism         . 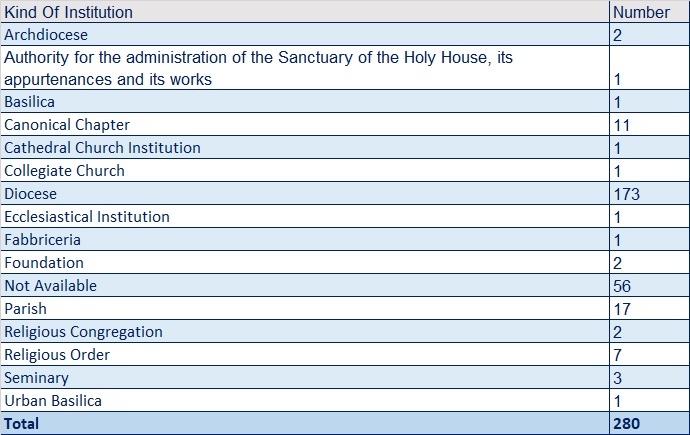 Indeed, one of the more important documents produced by the Church regarding the topic  (The Pontifical Commission for the Cultural Heritage of the Church, 2001), express some of the most important components of Ecclesiastical Museums. In the “circular letter”, Ecclesiastical Museums are appointed as drivers of both cultural and evangelic functions: firstly, it is acknowledged the appeal of cultural treasures in promoting the new evangelization, thanks to the variety of artistic forms [that] shows constant creation of Christian cultures. The document, in fact, expresses the museum as the place where there are developed (in an ecclesial sense) functions of preservation, presentation with the aim of safeguarding memory. This substantial similitude of aims and objectives, allow us in analyzing the “Ecclesiastical Museum” object following the same methodologies with which is possible to analyze every kind of museums present on a territory. As occurs in most analysis of museums characteristics, this kind of cultural institutions, beside the proper artworks stored and displayed, could be classified on the basis of the services that they provide to visitors. Such approach start from the basic assumption that the focus of museum organization should be centered on the visitor experience, and that a wide set of services offered to visitors implies a concrete commitment of the management of the museums in providing visitors with proper cultural and added-value services. In the first map, we show the distribution of the ecclesiastical museums diversified on the kind of institution and legal entity. The table classifies all the services registered in 7 main categories. Finally, the following map shows the distribution of Ecclesiastical Museums differentiated on the basis of the quantitative adoption of the services analyzed, where 0 indicates that the museum provide visitors with no service at all; 1 indicates that the museums can provide visitors with 0-25% of the services; 2, for more than 25 and less of the 50%, and so on. Thanks to the map visualization it is possible to underline some trends within the geographical distribution of the Ecclesiastical Museum. Despite the distribution of single category of services does not show important differences between north and south of Italiy, the distribution aggregated show a concentration of museums that offer more than the 75% of the services listed, in the northern side of the Country. Proposed analyses have visible limits that is important to underline: first, the categories are arbitrary. This implies that different categorization are possible and that could lead to different results. Second, in the single category analyses an on-off approach has been adopted: in other terms, a museum providing visitors with 3 of 4 services included in the category has been classified with 0. This approach has been adopted in order to show consistent results. 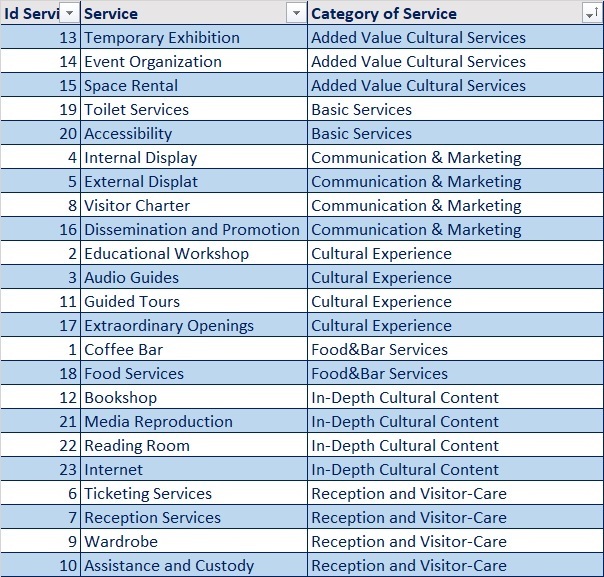 Third, the categories include both services space-related and management related. This implies that for some museums providing visitors with specific services is not possible at all. In spite of these limits, the conduced analyses allow us to highlight two main characteristics of the Ecclesiastical Museums. The first remark is that ecclesiastical museums represent a widespread network of cultural resources along all the Country. The second one is that this network is represented by museums that are, at a various degree, concerned with the production and the providing of different categories of services to their visitors. These characteristics define a set of resources that could play an important role in the cultural offer of territories. This is particularly true in recent times, also thanks to the affirmation and the rise of particular cultural and touristic consumption that could be easily associated with a visit in small museums, especially in non-conventional cities or small towns. It is not only the case of religious tourism, which combines natural elements with a spiritual and experiential attitude, but also the case of the sustainable tourism (in its wider sense) that could combine peculiar characteristics of the touristic experience (food, wine, nature, routes) with the discovering of unexpected beauties. In this sense, a territorial offer mixing both naturalistic and cultural elements could represent a valid experience for those tourists or citizens that are unlikely to be satisfied by hit-and-run visits and that are, rather, more attracted by meaningful experiences. For the Ecclesiastical Museums it could be an important opportunity to reach different kind of visitors , and to empower the evangelization function that is one of the main objectives that they pursue. The creation of such a network could help bone’s territories  and marginal destinations  in reaching an autonomous cultural and touristic identity through which set up and communicate a cultural offer concretely matching potential visitors’ needs.